The veteran boss questioned where any potential signings would figure within his squad. Ferguson has dismissed suggestions that his squad needs to be altered significantly. 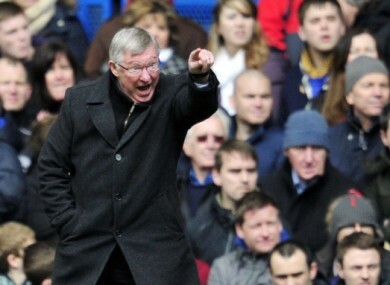 ALEX FERGUSON INSISTS Manchester United’s squad is not in need of a radical overhaul in readiness for next season. With his side 13 points clear and the Premier League title just one win away, Ferguson revealed that he would be more likely to secure a couple of low-key arrivals than any big-name signings. United have been linked with a host of forwards, including Borussia Dortmund’s Robert Lewandowski and Juventus’ Arturo Vidal, while speculation continues to surround Wayne Rooney’s future at Old Trafford. But Ferguson questioned where any potential signings would figure within his squad. United will be able to call on the services of highly-rated forward Wilfried Zaha when the Englishman completes his move from Crystal Palace next season, while defender Fabio will return from his loan at Queens Park Rangers as well. This led Ferguson to describe any potential squad changes in the close season as “minor”. Email “Ferguson not seeking to rebuild Manchester United”. Feedback on “Ferguson not seeking to rebuild Manchester United”.